Above Don is working on the Willis Machine Sprinter in the hotel "pits" Don Barnes Passes away suddenly on February 8th. Don Barnes passed away on Thursday night, Feb 8, 2001, of an apparent heart attack. This shocking news leaves his teammates, friends and family mourning the loss of a dear friend. Don was a man of many talents. Perhaps the best of all was his ability to make everyone around him better. 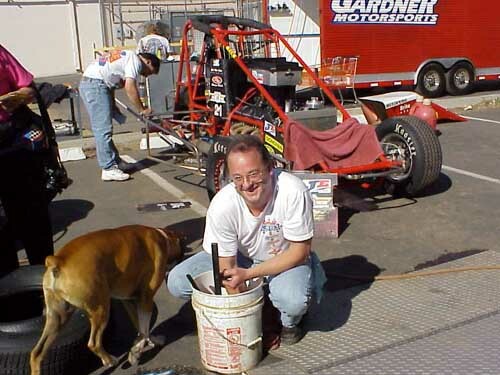 His warm smile and a handshake were staples of his, as he was well known in the SCRA pits. A respected member of the Harlan Willis crew, he was a sponsor, a worker, a cheerleader, a fan, a radiant beacon and more since '97. He never met anyone, or a race, that he didn't like. Don's personality radiated happiness to everyone around him. It rubbed off, the joy he shared with our sport. He got his hands dirty doing what he loved. After he began hanging out with Harlan's crew, it was natural for him to get more involved. When I first met Don he was known as "Selway Don," because he brought that sponsor to the team. He seemed to always be in the middle of the action at the track, and yet his business kept him on the move constantly. He and wife, Diane, had a daughter, Stephanie, and son, Derrick. He was a good family man on top of everything else. His daughter would sometimes go racing with dad, and his son was the builder of Cory Kruseman's web page. Don Barnes loved racing and put all his energy into "his" team at the track. And, he loved road trips. I remember him showing up in Indiana to support Cory during one Sprintweek, when the rest of his teammates stayed home to work. He was part of the SCRA scene and will be missed by all who knew him. Don was too young to leave us, but we will not forget his smile, his handshake and that constant look of pleasure in his eye. He was a friend of many. Rest in peace, Don, you will be missed.